This will be our very last food box from our CSA here in New York City. 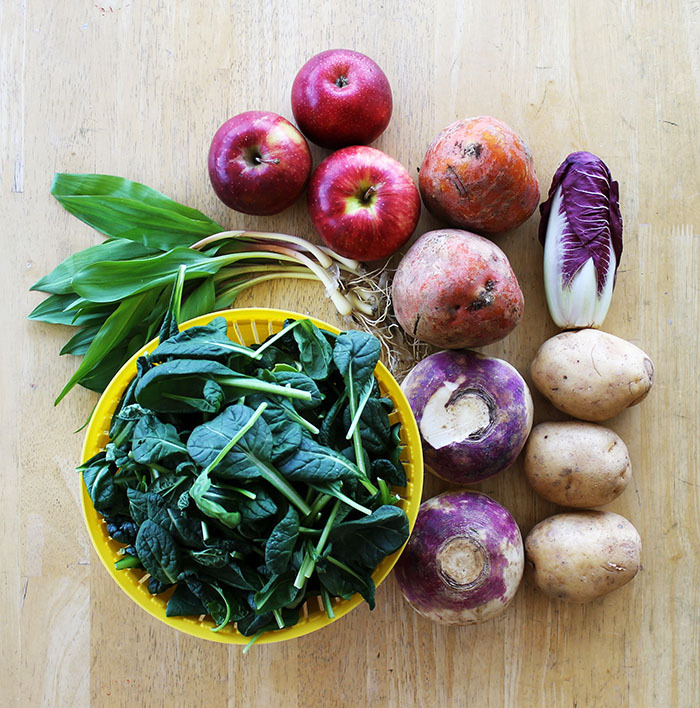 As a grand finale, we have Jonagold apples, ramps (wild leeks), golden beets, Treviso radicchio, tatsoi (AKA spinach mustard or rosette bok choy), purple top white globe turnips, and chef potatoes. 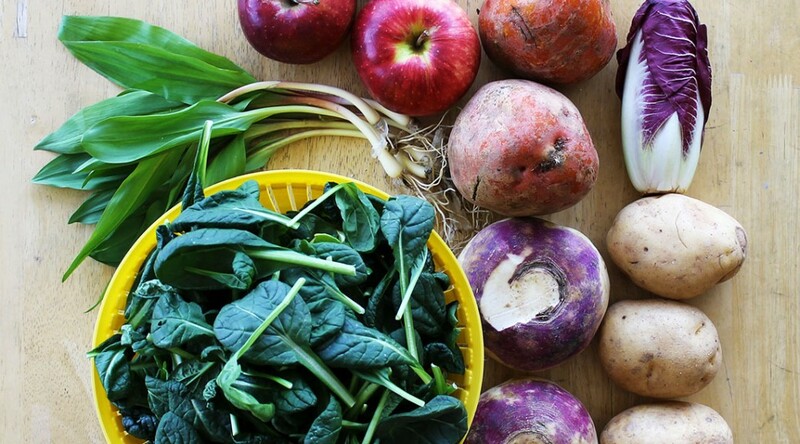 Perhaps we have unknowingly consumed them before, but we’ve certainly never heard of ramps. What we’ve learned about them is fascinating! They’re scarce because they grow exceedingly slowly (four years!) and are only in-season a few weeks of the year. In recent years, they’re all the craze among foodies and chefs: “The Church of the Ramp is one of the fastest-growing denominations in the religion of seasonality.” Due to a combination of the plant’s rarity and the explosion of enthusiasm for it, wild ramps are wantonly overharvested. In Quebec, there are firm restrictions on commercial sales and harvesting more than personal consumption, giving rise to an active black market for the coveted wild ramps. Smugglers bring bulbs to neighboring provinces including Ontario, where sales are legal… and they make a cushy profit. If you’re interested in learning more about the role of ramps in the food universe, here are a couple of amusingly written reflections on ramps from Huffington Post and TIME Magazine. The other vegetable in our food box with which we’re less familiar is radicchio. Radicchios aren’t lettuce or cabbage. They come from northern Italy and the varieties are named after towns within the Veneto region. We Americans are most familiar with Rosso di Verona radicchio while Italians most commonly eat Treviso radicchio. Now – late winter – is exactly when radicchios peak. Looking back, our first experiences with a CSA has been quite a fun and delicious culinary adventure! It’s provided us with months of experimentation, learning, and full stomachs for us and our friends! Each week we’ve had the pleasure of produce that is fresh from the farm; we’ve tasted foods we’ve never purchased or even encountered; and we’ve discovered new recipes along the way. Even beyond the kitchen, we support the overall concept of community-supported agriculture and the economically and environmentally sustainability that it facilitates. There is an obvious relationship between farmer and consumer with the sale of any kind of produce, but CSAs make that relationship more of a partnership that benefits both parties. Hopefully CSA models will become more common and more available – because it works! By the way, if you are familiar with any CSAs in the Boston area (that are reliable and have flexible terms) please let us know!